scrapsecrets | Ideas for scrap booking projects, new techniques and product review and usages! Welcome back! Well, that was more for me than you all. I have been missing for awhile, I know. Things have been crazy here. I moved, lost a job, got a new job and have already decided that the craft room that I set up about a year ago doesn’t work for me. I am in the process of redoing the craft room, so that will keep me busy for awhile. Anyway, I started up the Sketch Sunday series again yesterday. I made my first card based off of the sketch from My Favorite Things. The link will be listed at the end of the post. You have until 12:00 Noon EST to enter their contest. But don’t worry – there’s a new one every week! When I was redoing my craft room, I found a bunch of supplies that I thought I had lost! One of those things was my heat gun. So, of course, I had to use it on this card. Here is the link to the video I made if you want to see how I created it. Posted in card making, distress ink, sketch challenge, sketch sunday, technique, VersaMark, YouTube. Bookmark the permalink. So, I have missed a couple of posts lately. Whoops! Life here has been crazy. I put my house up for sale before the summer and spent the entire summer (and part of fall) cleaning for open houses and showings. Needless to say, my crafting was put on hold. My craft supplies were packed up in so many boxes that they probably outnumbered boxes in all other rooms (combined)! I moved into my new house at the end of October and started to set up my craft room. Unfortunately, it was the last room that needed to be worked out, but the one I wanted to the most! It’s almost complete – I will be posting a room tour video soon! The last pieces should be arriving at my house tomorrow, if the snow storm hasn’t delayed their delivery. I have started to get back into a crafting routine, which includes Sketch Sunday. I even was able to participate in this month’s hashtag event! (You can see the videos over at my YouTube channel – link listed below). I started with a pre-made kraft card stock card base that measures 8″ x 5 1/2″. I used my Martha Stewart bone folder to score the card at 4″ and make the creases more crisp. This made the card 4″ x 5 1/2″. The front of the card was made by using a piece of green Recollections card stock that was cut 1/8″ smaller than the card base. I then cut a piece of white Recollections card stock 1/8″ smaller than the green mat. I took the white piece of card stock and placed it in the MISTI. Placing the My Favorite Things cling stamp Birthday Background in the MISTI, I inked it up with My Favorite Things Gumdrop Green and stamped it on the white card stock piece. Then, I used washi tape to secure the white piece to the Heidi Swapp stencil. In the open areas of the stencil, I used Tim Holtz Mermaid Lagoon distress ink and a mini ink blending tool to create the two blue bands over the words. I took the same green Recollections card stock and ran it through the Cuttlebug with the Simon Says Stamp die that says “Brothers”. I did this four times and then I took all four pieces and secured them together with my Zig Two Way glue pen. After they were stuck together, I used my CutterBee scissors to cut off the “s” in Brothers. Using the same glue, I attached the word “Brother” to the right side of the top blue band. For the inside sentiment, I used another My Favorite Things stamp set called Delicious Birthday. The white layer is 3 1/4″ x 3 3/4″ and the green layer is 1/8″ larger than the white layer. The sentiment I chose was “It’s Your Day Get Your Cake On”. I inked it up in the same Gumdrop Green My Favorite Things hybrid ink that I used for the background stamp on the front of the card. I also stamped the set of five candles that comes with the set in the bottom right corner. Posted in card making, Challenge, Cuttlebug, distress ink, ideas, sketch challenge, sketch sunday, stamps and tagged birthday card, Brother steel die, candles, masculine birthday card, mermaid lagoon distress ink, My favorite things, Simon Says Stamp. Bookmark the permalink. I can’t believe that I have done 32 weeks of challenges! True, it wasn’t 32 straight weeks. I have never been that great at consistency, unfortunately. But lately I have been trying to be better at it. Sometimes life just gets in the way! I made a video for Sketch Sunday showing how I put the card together. I also did a voice over in this one, which is something I haven’t done for awhile. Usually I don’t have much time to edit the video, so it goes up as is! Posted in Uncategorized and tagged ATG, creating a card from a sketch, creating your own background paper, creating your own patterned paper, distress ink, finger dauber, Geek is Chic, Grape Jelly, Hero Arts shadow ink, hybrid ink, matching stamps and die set, Mid tone ink, My favorite things, Navy, razzle berry, sketch challenge, sketch sunday, using a sketch to create a card, using scraps of pattern paper, worn lipstick, zig 2 way glue pen. Bookmark the permalink. where no matter what you did, nothing would go your way? That’s how tonight’s crafting adventure ended up! I was working on my last project for the #pawgustart event and every thing I started wasn’t to my liking. I started out trying to watercolor with distress inks, but couldn’t find my heat tool to heat emboss the image. So then I decided to paper piece the image. That turned out ok and I continued to work on the card. The next step was to use ink on an embossing folder to create trees and a blue (inked) background. When I added the paper pieced owls onto it, I did not like the way it looked. I decided to scrap that project (after making two video parts for it, totaling over half an hour!) to work on making a flip card from a steel die. I have never really done one, so I thought I would give it a try. First attempt was poor at best! I tried to cut two pieces of patterned paper and glue one down to each side. The card would get stuck as you were flipping it. I gave up on that idea and decided to cut a new base out of white card stock, use the center pieces from my failed attempt and go from there. I took a Heidi Swapp 12 x 12 heart stencil and used Barn Door distress ink to create the background. Next, I glued on the pieces that I cut out from my “failed” attempt at the flip card to cover the middle piece that flipped. 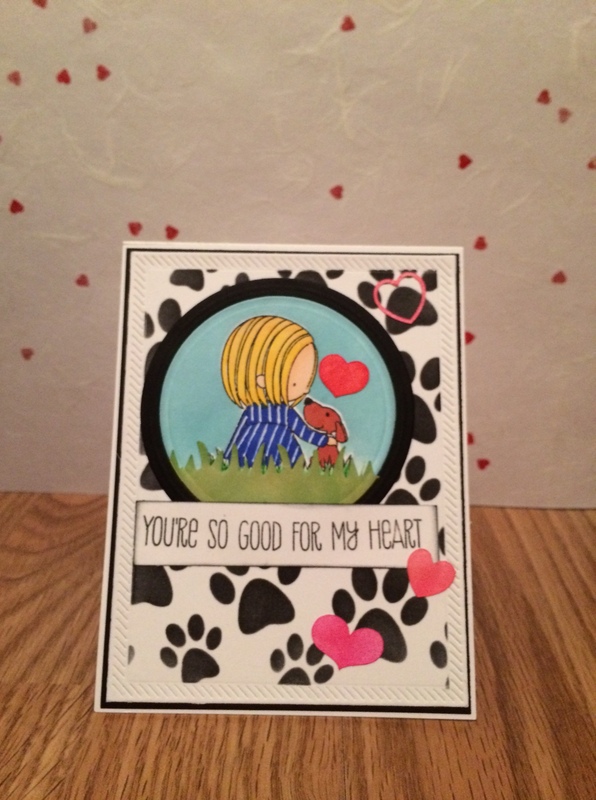 I used the stamps from the Simon Says Stamp Circle Friends stamp set to create the background, bear and the sentiment. I added some clear gems for some sparkle to the card. 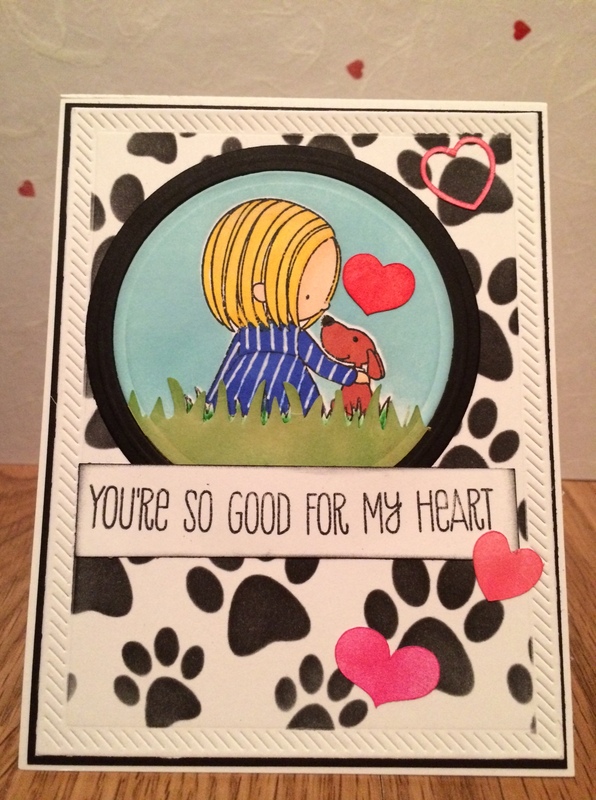 Posted in card making, Challenge, Cuttlebug, distress ink, stamps and tagged #pawgustart, 12 x 12 stencil, art collaboration, art event, barn door, bear, Black licorice hybrid ink, card making, circle friends stamp set, clear gems, distress ink, fiskars circle puch, flip card, gems, hearts, heidi swapp, My favorite things, red hot hybrid ink, Simon Says Stamp, stencil, stripes. Bookmark the permalink. 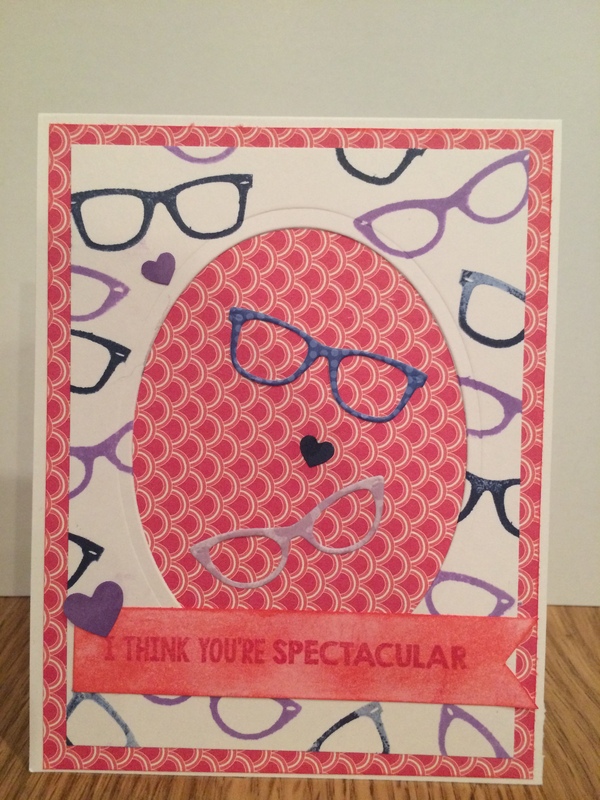 Posted in card making, Challenge, sketch challenge, sketch sunday, Uncategorized. Bookmark the permalink. First, I started out with 120 lb white card stock that I got from Michael’s. I decided to make it a side folding card. I then used 60 lb white card stock to cut out the largest My Favorite Things In and Out Diagonal Stitched Rectangle dies in my Cuttlebug. After it was cut out, I used the My Favorite Things Myriad Dots Mixable stencil with some Tumbled Glass and Salty Ocean distress ink with a round ink blending tool to create a dot pattern. I cut out a piece of white card stock a 1/8 of an inch larger than this piece and inked around the edges with the same two distress inks so that it would create a nice mat that would match the first layer perfectly. The second largest die from the MFT In and Out Diagonal Stitched dies was used with one of the blue paper packs I got from the Michael’s Dollar section. The last thing I used the Cuttlebug for was to cut out three layers of letters from My Favorite Things. (I can’t remember the name of the letter die set that I used. It’s an all lowercase alphabet die set from them though). I used the Salty Ocean distress ink on some white card stock and cut out the first set of letters. The next two sets were done in plain white card stock and then I layered them together. This gave the card some dimension and took the place of the banner from the sketch. 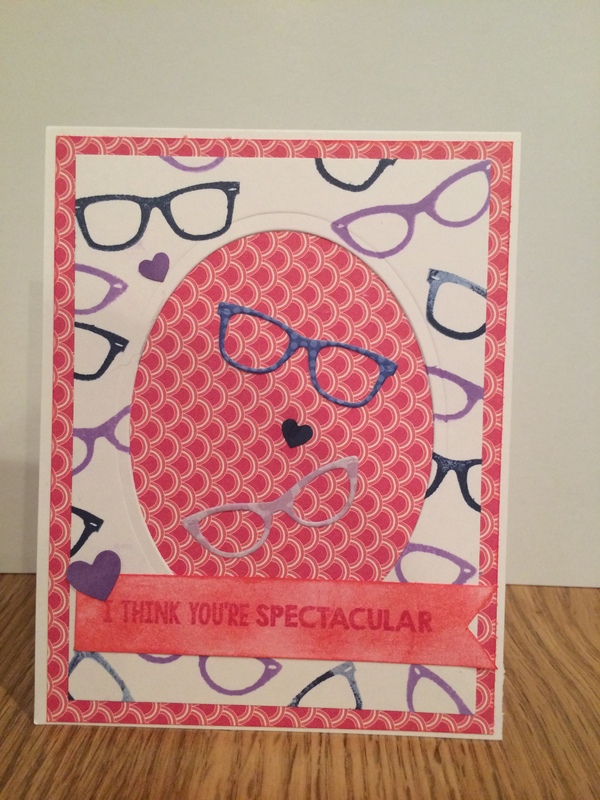 The last element on the card was a circle I cut using the x-large Fiskar’s circle punch. I used the same white card stock that I used for all the layers (except the base). The sentiment was from the My Favorite Things Beautiful Baby stamp set and was inked up using Hero Arts Shadow Ink Cornflower in Mid Tone. I also inked around the edge of the circle in Salty Ocean distress ink. Thanks for stopping by! Feel free to leave comments or questions. Posted in baby boy card, sketch challenge, sketch sunday and tagged Baby boy card, baby card, distress ink, Hero Arts shadow ink, My favorite things, sketch challenge. Bookmark the permalink. I have so many supplies that I haven’t used. I have been trying to be good and not buy more, but it’s so tough when companies come out with such adorable things every month. However, since I am unemployed (just for a week in between my old and new jobs! ), I decided that I need to be extra good and not buy anything. Plus, with my sister in law’s baby shower coming up next week, I need to focus my time and energy on finishing the decorations for her shower. So, instead of browsing the normal websites, I decided to browse my collection of stamps and find things that I haven’t used (or haven’t used that much). I used the usual sketch challenge this week and drew the sketch on a scratch piece of paper. I labeled parts of the sketch with what stamps I thought I would use. For the most part I think that I did use what I said I was going to use. I started off with the background of the card. I bought the My Favorite Things Happy Birthday background stamp in one of the last hauls and I inked it up with MFT’s hybrid ink in Grape Jelly. It was the lightest of the three purple inks I chose for the card. The card base is 4 1/4″ x 5 1/2″ and the birthday stamped piece is an 1/8″ smaller. When I use background stamps like this, I ink up the stamp and then bring the paper to the stamp. This makes it easier to line up the stamp straight and it easier for me to apply even pressure so that I am sure that the whole piece got inked up. 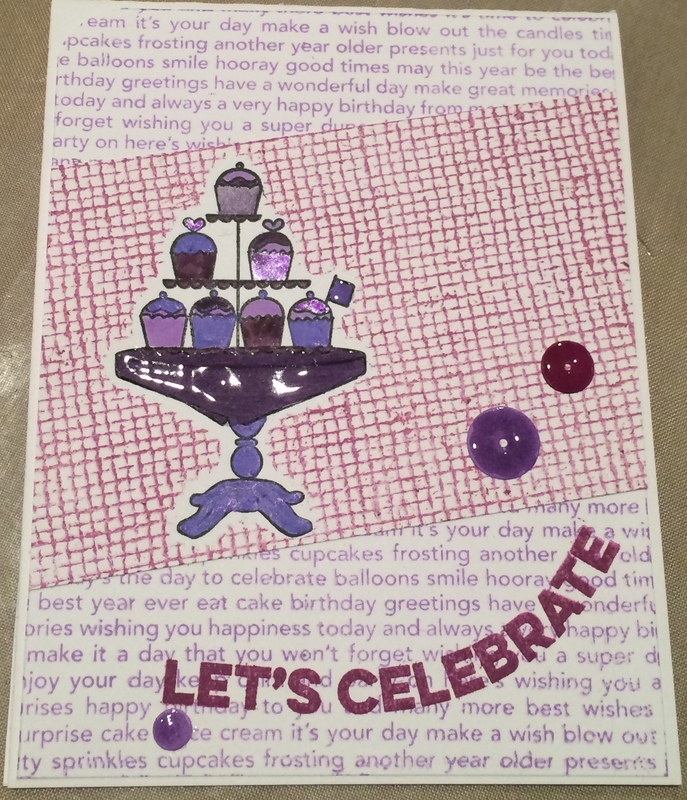 I then took a piece of scrap card stock that was 3″ wide and stamped the cupcake tower image from the MFT Cupcake Cuties stamp set. I placed it on the happy birthday stamped layer to see what angle I needed the piece at, stamped and then cut the piece down. Then I placed the cupcake tower mask over the stamped image and inked up the MFT burlap background stamp in My Favorite Things Pure Plum hybrid ink. I took the piece, image side down, and placed it over the background stamp to give that piece some texture. When I removed the mask, there was a small white border around the image. It didn’t bother me, but if this will bother you, you can use masking fluid or rubber cement on the image, stamp the background over the image and then peel up the “mask”. After I attached the smaller piece to the background, I rounded the top left corner and attached them both to the card base. I then stamped up the sentiment “Let’s Celebrate” in Hero Arts Shadow Ink Grape Juice. The finishing touch on the card came when I added the sequins that I made to match the three colors of ink I used to stamp the card in. I had taken some scrap card stock, swiped all three inks in a line and used my MFT sequins dies to create the embellishments. This is where I stopped in the video. After I was done filming, I decided to take a bunch of markers and glitter pens I had in purple and colored in the cupcake tower. Since I wanted the card to remain monochromatic, I made sure to only use purple colors. I thought the card needed a little more so I also used some glossy accents on the sequins and the table cloth for the cupcake tower. Posted in Uncategorized and tagged ATG, birthday card, card inspiration, cards, challenge, Corner Chomper, creating a card from a sketch, Hero Arts shadow ink, hybrid ink, My favorite things, My Favorite Things Stamps. Bookmark the permalink.